Forestry Commission rangers are urging people to look to the sky for signs of incoming ospreys! The iconic creature – extinct in England for over 150 years - has bred successfully every season in Kielder Water & Forest Park since 2009, producing 12 bouncy chicks from two nests. Now the clock is ticking down on the much anticipated return of the adult birds, with the male hopefully arriving back by the end of the month and the female following soon after for a romantic reunion. To ensure a warm welcome, tree climbing rangers visited the oldest osprey nest in Kielder Water & Forest Park to do a spring clean. Not only was the nest re-decked with fresh moss and vegetation, but new high definition CCTV cameras were installed to provide the clearest picture yet of the historic nest for nature lovers at Kielder Castle and Northumbrian Water’s Leaplish Waterside Park. Three other artificial nesting sites in the forest, one of which produced two chicks last year, are also being given a make-over. This will ensure that if the osprey population expands pairs can nest in safe locations. Adding to the osprey excitement is the fact that the first chicks born in Kielder in 2009 will be looking to start their own families this spring, providing they survived the rigours of early life. 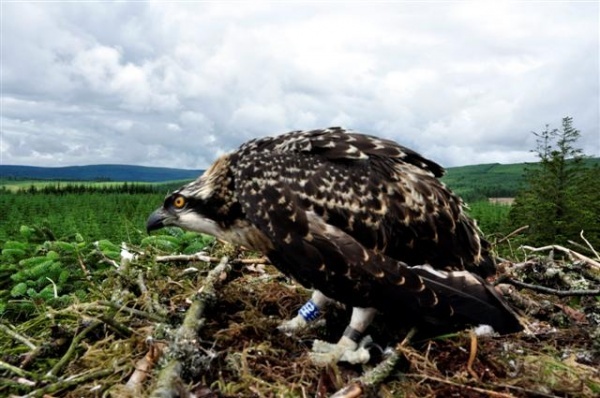 They will not necessarily make a beeline for Kielder, but because the chicks were all tagged with unique rings and colour tags on their legs it's possible we may still learn of their fate from sightings elsewhere. 2. Kielder Water & Forest Park Development Trust is a registered charity working at Kielder to promote sustainable development, provide recreational facilities, improve knowledge of the natural environment and encourage the arts. The Trust works with the range of communities to benefit from these activities. Members, who have appointed directors/trustees to serve on the board, are Northumbrian Water, Forestry Commission, Calvert Trust Kielder and Northumberland County Council. Affiliate organisations that are not members but have a close working relationship with KWFPDT include Arts Council England, Northumberland Wildlife Trust, Environment Agency, The Scout Association and local decision making bodies such as the parish councils.